Arriving on our bus from Mui Ne (100,000d/$5, 4 hours) to Pham Ngu Lao (the main backpacker district — kind of like a smaller version of Khao San Road, Bangkok), we no longer felt scared, but excited to be in Saigon. We crossed the street (like pros) and, as it started to rain, we ducked into the alley at 241 Pham Ngu Lao. 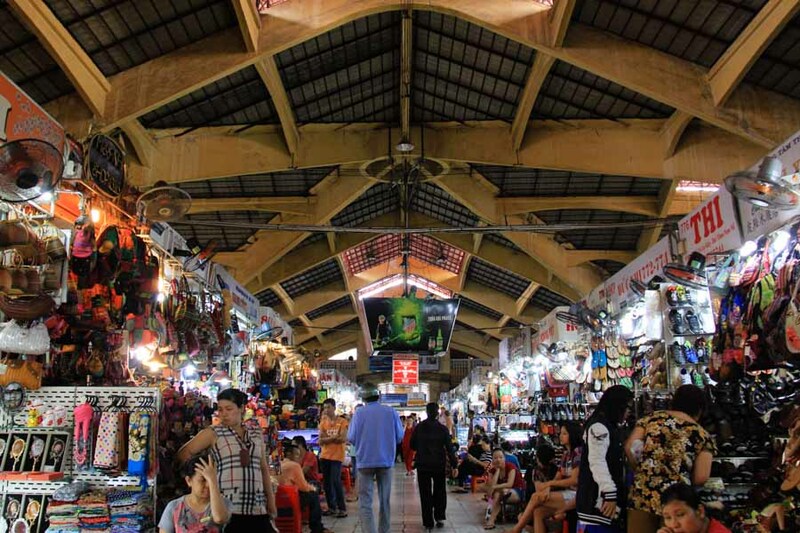 The area around Pham Ngu Lao fits perfectly into a budget guide to Ho Chi Minh City, because of its cheap guesthouses. We had not booked one ahead of time, a decision we were not sure was wise as we had arrived during Vietnam’s largest holiday (next to Tet), Liberation Day. Together with Labour Day, plus the weekend, it gave the Vietnamese a four-day holiday. The first few guesthouses we inquired at were full but Ly Loan Guesthouse had a nice AC room with a TV, fridge, and a private bathroom for 324,000d/$16. Ly Loan. Head down the alley at 241 Pham Ngu Lao. It’s in a smaller alley by the Indian restaurant. It turns out that the best thing to do during Liberation Day is to get away from the seaside resorts. Many hotels will increase their prices to extortionate amounts. For example, Kim Ngan Hotel in Nha Trang went from $15 to $60/night! Ly Loan Guesthouse was wonderful. It is family owned and run and the owner helped us during our stay with excellent restaurant recommendations, making sure we didn’t pay too much for anything, and telling us how to take local buses to the Mekong Delta. She also took care of Ryan when he slipped in the bath like an old lady and hurt his wrist. She massaged the stinky but magical Tiger Balm onto it and made him feel all better. She also bought us bananas for breakfast. It was like having a Vietnamese mother for five days. Swanky bar for hosting evil parties. Bomb shelter with multiple phone lines. Rooftop helipad for daring evil escape. 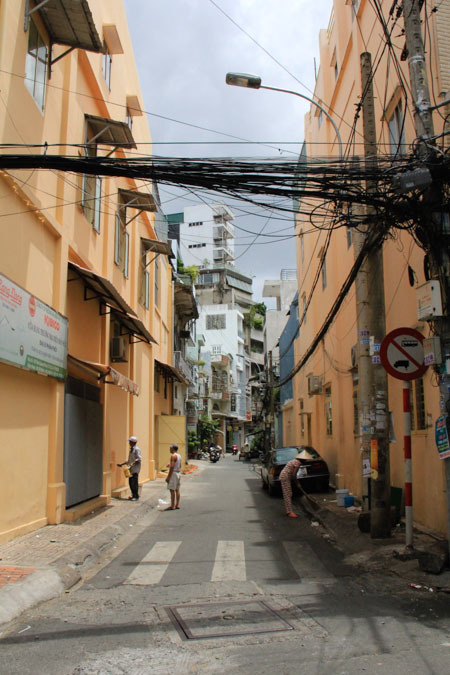 Ho Chi Minh City is walkable. It is very flat; and if it weren’t for the heat, you could walk around all day discovering alleyways, back streets, markets, cafes, and the like. The highlight of the day was Reunification Palace (30,000d/$1.50) which on first glance appears to be nothing more than a sixties looking government building, but going in for a closer look reveals that it was clearly used as an evil Bond-style villain’s hideout. It has been left exactly as it was found in 1975 when a communist tank crashed through the gates upon Saigon’s surrender. Ben Thanh, the central market, has an abundance of crap to buy and serves up delicious food. At night, many of the stalls move out to the streets that surround the market. Now would be a good time to try out your bargaining skills and buy a Vietnamese flag t-shirt. We got one for 50,000d/$2.50! You can judge how well you did by how huffy they are when they take your money. So our Ho Chi Minh City days were spent perusing the markets, buying souvenirs, seeing the sights, and drinking bia hoi (fresh beer). Bia Hoi places are not as numerous in the south as they are in the north, but they are a great place to drink cheap beer (6000d/$0.30 per glass) and chat to travellers, and locals who come to practise their English. We met a somewhat heartbroken Vietnamese guy who was recently dumped when he proposed a very “untraditional” act to his girlfriend, a Korean man who moved to Saigon for a much younger girl, a set of potentially evil twins who went on and on about smuggling babies out of Vietnam and making top dollar to do it (they were joking..?). It’s amazing how quickly beers go down when you combine them with cheap prices and entertaining conversation. We left Saigon, reluctant to leave behind our new mother and drinking buddies, and headed into the Mekong Delta. First stop, Ben Tre. Why would you come to Vietnam to stay in Chinatown? Because it’s awesome. I wouldn’t call Vietnam’s Chinatown, aka Cho Lon (which means great market) entirely Chinese. It’s inspired by China — a lot of things in Vietnam are. My point is, don’t feel like you’re not getting a Vietnamese experience in Cho Lon. It’s probably more Vietnamese than the backpacker district. Cho Lon actually consists of part of district 5, and a few neighborhoods of district 6. It’s very easy to get to. You can take a taxi along the river for about 15 minutes (100,000 VND) or take bus #1 from Ben Thanh station (runs every 5 minutes, takes about 35 minutes, cost is around 8000 VND each). It will drop you off just north of Binh Tay Market, which you should definitely check out. The locals just refer to it as Cho Lon. 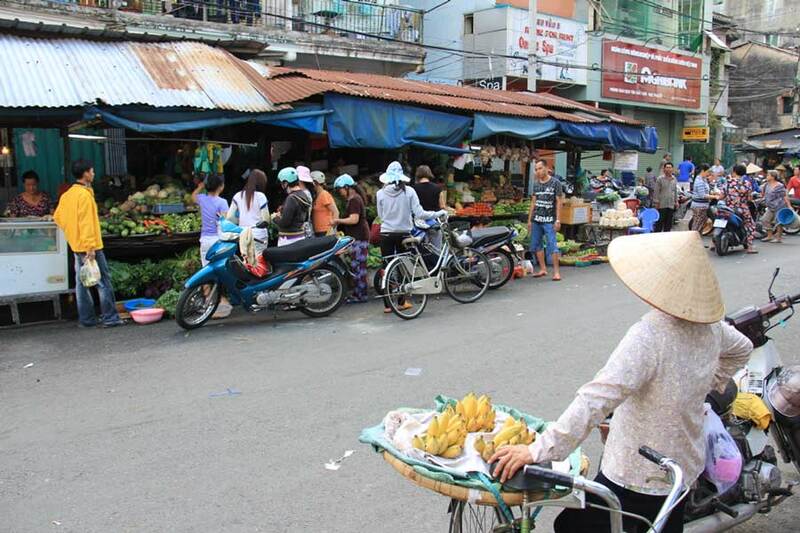 Don’t be fooled by what the guide books say about Ben Thanh, Binh Tay is the largest market in Saigon. It’s also more authentic and less likely to rip you off. Have a walk around, go upstairs to the center of the building where you can look out across the roof, head to the eating area for a cheap and tasty lunch. 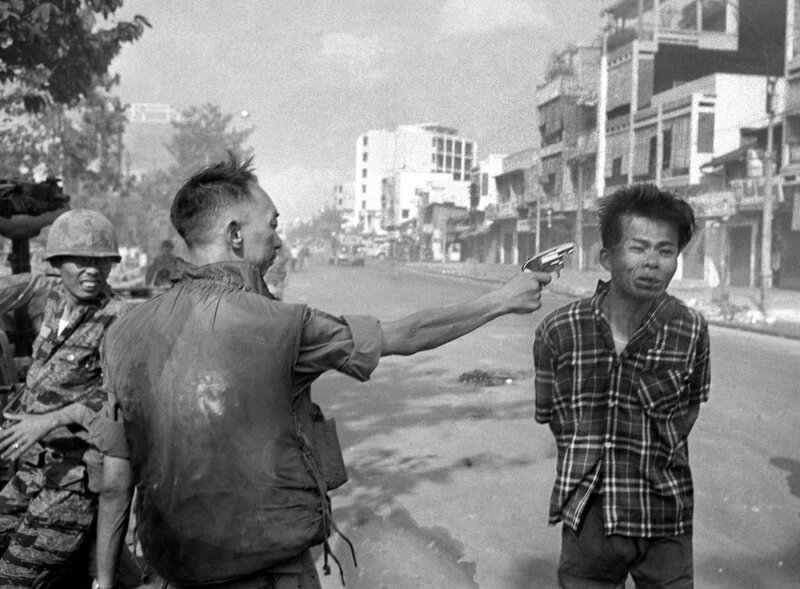 During the Vietnam War, the market was a popular place for American soldiers to make black market trades. 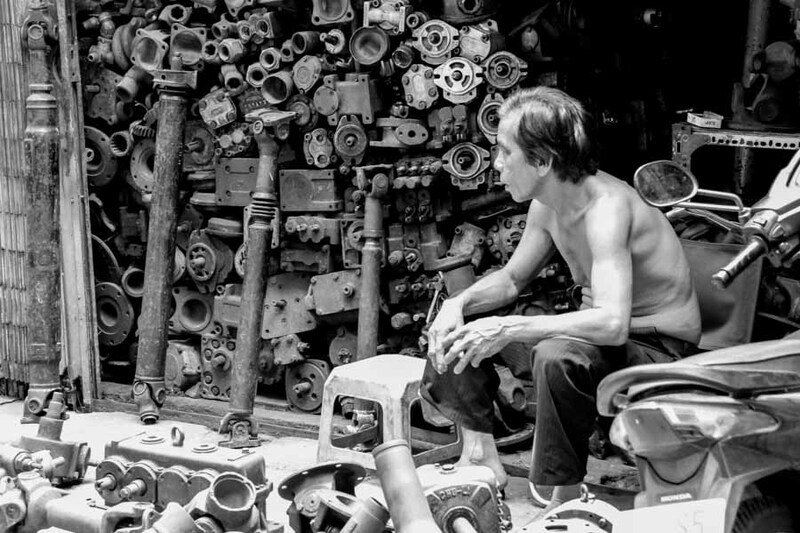 A motor shop, I think, in Cho Lon, Saigon’s Chinatown. If you head east on the street that runs along the south side of the market, you’ll walk past machinery stores with metals hanging, stores that sell wheels, all kinds of interesting hardware type stuff. I walked around for about an hour and took some great photos. Perhaps you want to make your way to Quan Am Pagoda (not to be confused with An Quang pagoda), a Chinese pagoda where you can stroll through the courtyard, past ponds, and gardens. That area, I’m not exactly sure where, is the location where this famous, and -WARNING!- graphic, photo was taken. At night, you can head to the night market and get a cheap meal. It’s located in Thong Nhat Stadium from 5PM until midnight. This night market, usually referred to as Ky Hoa, is the largest in Saigon (that’s right, bigger than Ben Thanh). Truong Giang Hotel is a great budget option. It’s about $15/night and the rooms have everything you need. The staff is very accommodating, specially the young Vietnamese guy that can speak English. It’s not the cheapest meal you can find (head to the market for that), but I absolutely love a big dim sum breakfast. I rant about this place in the section below, so all I’ll say here is: for the atmosphere and the food, it’s worth the extra $5. I also want to mention a place that serves up incredibly delicious goat curry. It is just up the street from the Windsor Plaza Hotel off of Su Van Hanh (there’s a sign that says something like Cà Ri Dê Ấn Độ). At night, the tables and chairs fill the alley and everyone is very happy… mainly because the food is delicious (but also because they’re probably a bit drunk). The curry is an Indian style one that goes great with goat. If you like spicy food, it’s a must-try in Saigon. Get it with a side of rice or bread. From Truong Giang Hotel, this place is about a 25 minute walk. Alternatively, walk up to Nguyen Trai and take the 54 bus east, getting off at 309 Tran Phu, where you must walk the same direction the bus was going to the roundabout. From there go up So Van Hanh and turn right into the alley when you see the sign. It sounds like a lot of work, but it’s worth it. If you just have to eat pho, Pho Le is usually considered the best pho in district 5, if not the whole city. 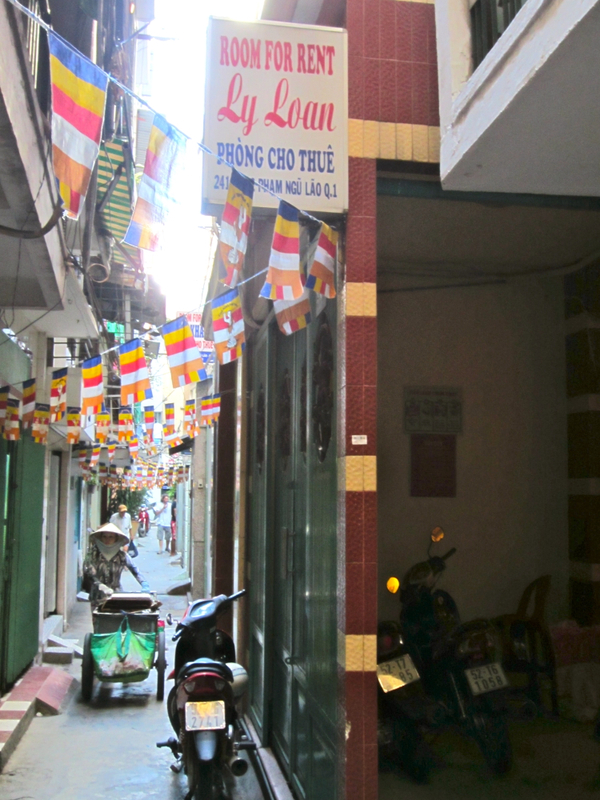 It’s about a 20 minute walk from Truong Giang Hotel. Saigon’s Tan Son Nhat International Airport is the largest and busiest airport in Vietnam. It will likely be the cheapest airport for you to fly into in Vietnam. To get from the airport to the tourist area, take the #152 bus that can be found to the right of the arrival’s entrance. The cost is 5000 VND (you may be charged an additional fee for your luggage). If taxi drivers tell you it’s not running anymore, roll your eyes and keep walking… Unless it’s after 6:15PM when the last bus leaves (or before 6AM before the bus starts). Between the hours of 6:15 and 8:00PM, you can walk for 25 minutes to catch the #3 bus (see map below), but the last #3 leaves at 8:30. After that you’ll have to taxi it. The best way to take a taxi is to exit the arrivals hall and head left to the taxi line. When you get to the front of the line, feel free to be a bit picky. Mai Linh and VinaSun are the taxi companies with the best reputation. There is often a Mai Linh lady close by that speaks English. She can hook you up with a car and let him know where you’re going. Most hotels in District 1 cost about 150,000 VND to get to. Coming to the airport, the last #152 airport bus leaves Ben Thanh’s bus station at 6:00PM. The first one leaves at 5:45AM. 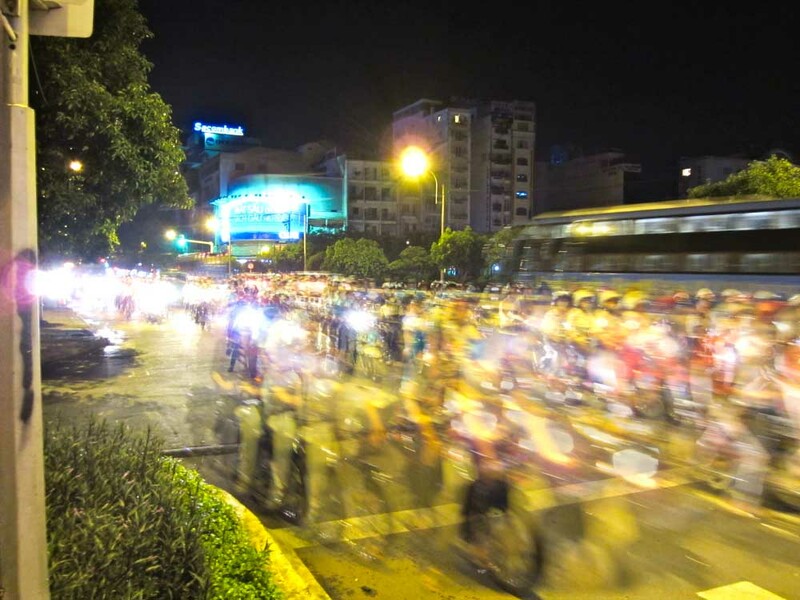 Note: The buses in Vietnam aren’t reliable. They could be early or late by up to a half hour. Ho Chi Minh now has a tourist bus that costs 20,000VND and is better equipped for luggage and non-Vietnamese speakers. Head to the information desk at the international terminal to find out what the most convenient stop to get off at is for you. The bus runs from 5:30AM to 1:30 AM. It’s bus #109 and is bright yellow. To get downtown it takes about 45 minutes. The Route: international terminal – domestic terminal – Truong Son – Tran Quoc Hoan – Lang Cha Ca roundabout – Hoang Van Thu – Nguyen Van Troi – Nam Ky Khoi Nghia – Nguyen Dinh Chieu – Cach Mang Thang 8 – Pham Hong Thai – Le Lai – Ben Thanh roundabout – Ben Thanh Bus Station – Pham Ngu Lao – September 23 Park. The small but chaotic station across from Ben Thanh market (usually refereed to as Ben Thanh station) will get you to the airport (#152), to Dai Nam Park (#616), Cu Chi city – where you can get a xe om to the tunnels (#13), Soui Tien water park (#19), Dam Sen water park (#11), Binh Tay market aka Cho Lon market (#1). Mien Tay station (western bus station) is used to go to the Mekong Delta. It’s somewhat far from the tourist district, but you can take the #2 or #39 bus from Ben Thanh’s bus station (both run every 15 minutes). Mien Dong station (eastern bus station) is pretty reliable for most buses heading east, or north. To get to it from Ben Thanh, take bus #93 or #45. This map can help you navigate all the stops. All that considered, the best way to get to your next destination is usually via one of the bus companies that run from the backpacker district. My favorite is Futa Bus. They’re usually pretty on-the-ball, clean, and accommodating. Another option is The Sinh Tourist. They have ticket offices all over Vietnam. They also have a hop-on-hop-off open bus program that allows you to buy a ticket to your final destination, choose all your stops along the way, and pay accordingly. It’s likely cheaper to do this option, but you’ll be limited to their buses, so there will be less flexibility in departure and arrival times. There are many other bus companies, so shop around if you can’t find a time or price that you like. If you go to the bus station, you can almost always find a cheaper option to your destination, but it might involve low quality buses that are packed too tight. The train station in Saigon is not that far from the downtown. You can get there by taking the #65 from Ben Thanh station. It’s possible to take the train to Phan Thiet (for Mui Ne), or to take the Reunification line all the way up to Hanoi, stopping most of the major cities along the way. The official train website allows you to purchase tickets online, select seats, pretty much everything you need. Taxis are fairly cheap, but if you prefer some adventure you can always hire a xe om to take you pretty much anywhere in the country. Xe om means vehicle hug, which makes sense because it’s a motorcycle taxi that involves holding on tight. You’ll have to negotiate with the driver before you set off. This can be a problem, especially if you’re a foreigners. If you’re a good negotiator, you’ll end up paying far less than a taxi, and you might have a bit of fun on the ride. Use this link sign up with Uber and you can save 50,000 VND on your first ride. Uber and GrabTaxi are now available in Ho Chi Minh City. They are often cheaper than a regular taxi, so it’s a great option if you need to get somewhere off the bus line. Just be aware of the credit card fees that might be associated with your card. It’s not hard to find a decent budget room in Ho Chi Minh City. If you head into the alleys around the backpacker district you’ll probably be approached by someone offering a room for $20. You can likely talk them down to $10. Be sure to see the room before you agree to take it. If you want to book something, Ly Loan Guesthouse is my pick. It’ll cost $17 a night, but you’ll probably save money if you just show up and see what’s available. In Saigon you can find almost anything. As someone who lives in Vietnam, I’ll often go for western food that I can’t normally get. For example, Quan Ut Ut is the best American BBQ in the city. Their ribs are worth sacrificing Vietnamese food, even for an American just visiting. That being said, they are definitely more expensive than almost any Vietnamese dish, and after eating them 3 times in 4 weeks, I had to take a 6 month break. This many people times 3, can’t be wrong. Probably my favourite place in all of Saigon is a dim sum restaurant in Chinatown. I don’t even know what it’s called, but it’s at 18 Ký Hoà (on the map below). The atmosphere is amazing. The food is even better. The place is only open until around noon, but I suggest you get there before 10:00AM or you risk not being able to get one of their specialties. On a weekend, you’ll probably have to climb to the third floor to find an open seat. As you make your ascent, you’ll get to see how cool the place is, and how good the food looks. Most dishes, which consist of 3 or 4 dumplings or 2 or 3 pork buns, are about 40-50,000 VND. We devoured about 7 dishes between the two of us, but we’re total beasts. I probably could have stopped at 5. They also serve a mean Italian style coffee here. Chinese egg tarts and Italian coffee — that’s about as close to world harmony as we’re going to get. If you want an authentic Vietnamese dish that’s very budget friendly, street food is a fantastic option. If you’re brave enough, wander around and go to a stand that’s busy. If you need some food ideas, I’ve made a collection of Vietnamese dishes with translations, photos, and a profile. It’s the ultimate guide for a foodie in Vietnam. 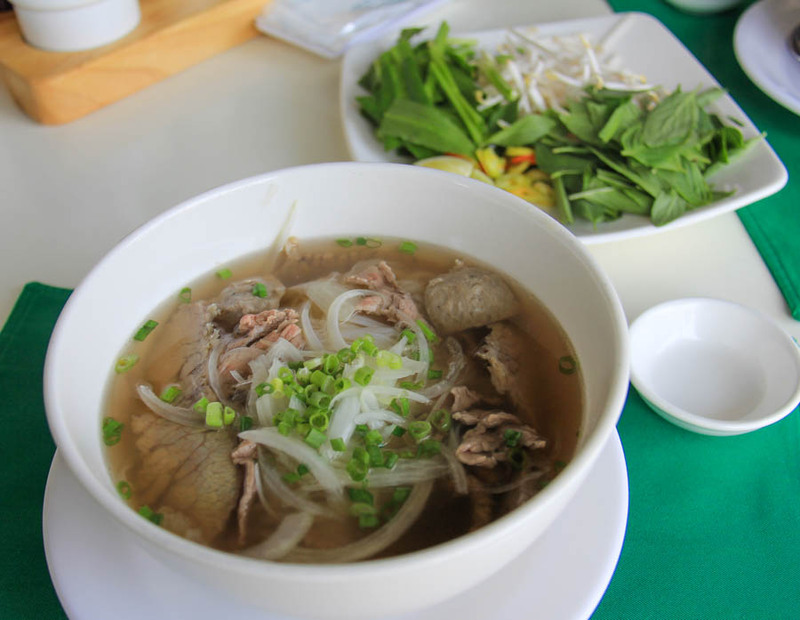 A beautiful bowl of pho bo – Vietnamese beef noodle soup. Since I have to pick one best budget restaurant in Saigon, I’ll offer up a bowl of the most popular food in the city — pho. If you are here, you know what it is. 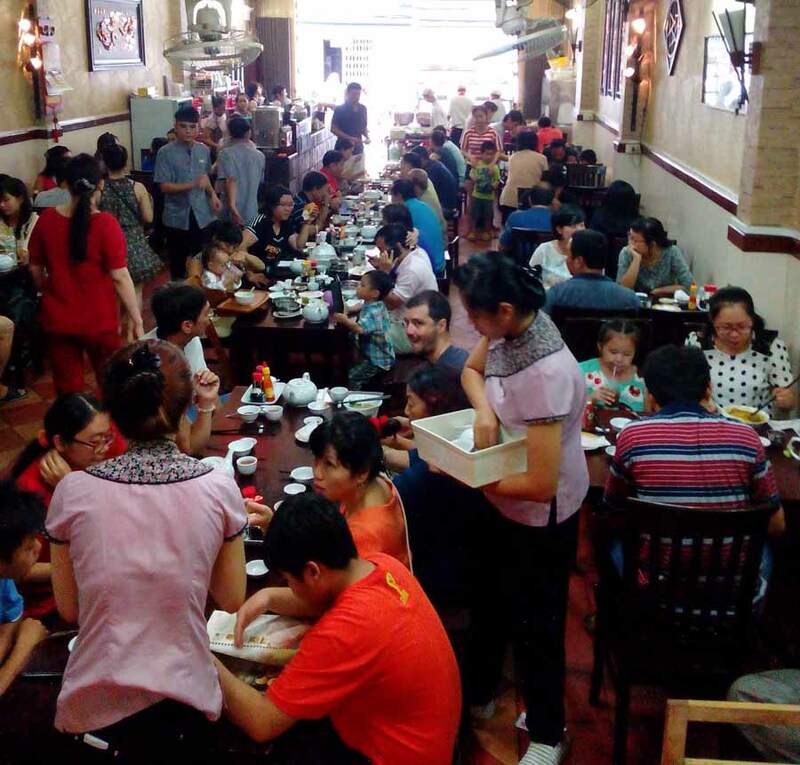 There is an on-going debate about where to get the best pho in Ho Chi Minh City — Pho Le (413 Nguyễn Trãi) is one of the more popular options, although some people who are particularly adverse to MSG say that their pho is packed with it. That being said, I am going to suggest Pho Thai San (174 Lê Lai) for it’s convenient location and authentic atmosphere. A bowl here will cost about 50,000 VND. It’s tasty and a great first meal in Vietnam. Get the details about the locations from the video. It’s unfortunate that the Mekong Delta doesn’t lie between Ho Chi Minh City and Hanoi, because it tends to be left off of itineraries. Often travelers will end up taking a day tour of the Mekong Delta instead. The delta deserves more of your time. It’s my favorite place in Vietnam, and it’s really like no other place in Vietnam. The difference between Ben Tre and Saigon is staggering, but it’s still my recommendation for your next stop. It’s a good place to relax. It’s often praised for having the best (or at least the cleanest) market in Vietnam, and it’s a great place to rent a scooter and go for a drive without having to take on any difficult or heavily trafficked roads. To get there: Make your way to Mien Tay bus station (from Ben Thanh station you can take the #2 or #39). At Mien Tay, go to ticket booth #20 and ask for Ben Tre. It should cost 75,000 VND. The buses leave every hour starting at 7AM. If you booked your hotel ahead in Ben Tre, have the name and address handy. The bus will likely be able to drop you off at the front door. Previous Vietnamese Beer Review Next Ben Tre, Vietnam: Tour-less in the Mekong Delta.